Dodgers Blue Heaven: Welcome to the Blue, Joel Peralta & Adam Liberatore! Welcome to the Blue, Joel Peralta & Adam Liberatore! Late last night, during the wee hours of the evening, the Dodgers announced their first real trade of the winter season. As many had hoped, the Dodgers were not satisfied with just righting the ship by displacing their former General Manager with a troupe of egghead sophisticates regarded by many as the cream of the crop. Oh no... They had business to attend to and after several weeks of debating, negotiating and studying they finally made their move. Last night, the Dodgers consummated a trade with the Tampa Bay Rays, former home of recent hiree Andrew Friedman, and I like it. We had a situation where two teams had a need to fill, so a deal got done. For the Dodgers, they received veteran right-handed reliever and Bellflower product Joel Peralta and 27-year old AAA lefty reliever Adam Liberatore. The Rays got fireball throwing righty Jose Dominguez and single-A prospect from Los Alamitos Greg Harris. This move shores up a Dodger bullpen that was largely ineffective last year. Peralta has been an able setup man the past few years and should slot in nicely behind closer Kenley Jansen. The second piece in the deal, Adam Liberatore, is a bit of an unknown, but based on his recent stats in AAA he may turn out to be a diamond in the rough. As a 27-year old lefty he recorded the best season of his career for the Durham Bulls last year. He got into 54 games and struck out 86 batters while batters hit just .187 against him. The Rays can’t protect everyone on their list, and if Liberatore was to be exposed, the thought process would be to get something else in return. Still, the lefty Liberatore had some shiny stats last year at Triple-A, including a 1.66 ERA and 1.65 FIP while striking out nearly 12/9. He takes the place of top-ten prospect Onelki Garcia, a southpaw reliever the Dodgers lost earlier today to the White Sox after designating from the 40-man. Dodgers fans are excited to have the Durham southpaw, and rightfully so. Via Alden Gonzalez at MLB.com, "Dodgers acquire Peralta from Rays in four-player trade." 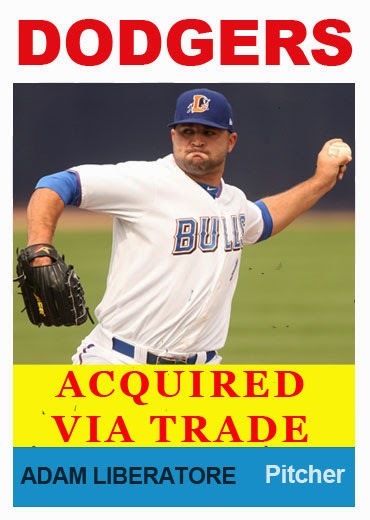 Via Eric Stephen at True Blue LA, "Dodgers acquire Joel Peralta, Adam Liberatore in 4-player trade with Rays." Via Jon Weisman at Dodger Insider, "Dodgers acquire pitchers Peralta, Liberatore from Rays." Via Dustin Nosler at Dodgers Digest, "Dodgers acquire Joel Peralta, Adam Liberatore for Jose Dominguez, Greg Harris." Via Schmitty at X-Rays Spex, "Hot-Stove: More On the Rays Roster Deadline Moves." Via Ian Malinowski at D Rays Bay, "Rays trade Joel Peralta and Adam Liberatore to Dodgers for younger arms." 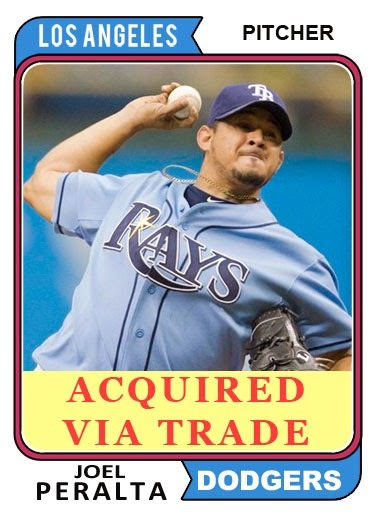 Via Ian Malinowski at D Rays Bay, "Joel Peralta: a trade without information imbalance." Via Marc Topkin at the Tampa Bay Times, "Silverman calls first deal with Friedman "smoothly awkward"
On a side note, don't you find it strange that the trade that actually gets done is one that hasn't been bandied about the "hot stove/rumor mill" like some teenage gossip about who's dating who? Strange, eh? And increasingly awkward for those who think the 'hot stove' means anything. In celebration of their arrival to the Dodgers I made the above fantasy cards for them. I used a photograph grabbed from a photo for the Peralta card from a Tampa Bay Times article and the 1974 Topps Baseball card design. For the Liberatore card I grabbed a photo from MiLB article and the 1964 Topps Baseball card design.